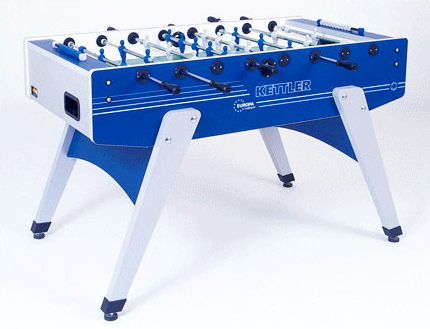 Kettler, being owned in Germany, offers the Europa table that is designed to look and play like other European tables that offer finesse and ball control. European tables are known for having angled legs which help provide additional support. The Europa is also one of only a hand full of models on the market that offers weatherproof features such as anti-rust chrome plating, and high grade laminate cabinet construction. It also offers telescopic rods, adjustable leg levelers, and players molded directly on the rods. If you are interested in a more traditional American style table, we recommend taking a look at the Cavalier Outdoor model by Kettler.